Arsenal, West Ham and Everton stars appear the best picks for fantasy football managers heading into Gameweek 16. Arsenal head into the match with struggling Huddersfield unbeaten in 20 matches and picking Aubameyang is almost a no-brainer. The Gabon international striker is the Premier League's top-scorer with ten goals and scored twice in last week's victory over rivals Tottenham at the Emirates. The Gunners appear to have a new lease of life under new boss Unai Emery and have scored 34 goals this season. Huddersfield have already conceded 26 times in 15 Premier League matches and have lost their last two matches. Aubameyang is priced at £11.2m in FPL and £12.5m in Sky Sports. Alexandre Lacazaette and Granit Xhaka are other Arsenal stars who have picked up decent points this season. West Ham have won back-to-back Premier League matches for the first time since January, 2017, and have more decent fixtures on the horizon. The Hammers host Crystal Palace on Saturday, before facing Fulham, Southampton, Watford and Burnley. Attacking midfielder Anderson is West Ham's top points scorer in both the FPL and Sky Sports competitions after five goals and one assist this season. He is priced at £7.1m in FPL and £8.7m in Sky and has returned 66 and 76 points respectively this season. With Marko Arnautovic out injured, Javier Hernandez might also be worth considering after two goals in the win at Newcastle last week. 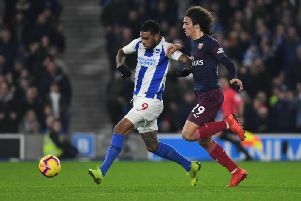 A cheap option in both FPL and Sky Sports, the Brighton striker could be a shrewd addition to squads. A hamstring injury meant the Seagulls' summer signing from Deportivo did not make his debut until November. He scored in his first start for the club in Saturday's 2-1 win at Huddersfield, before he netted a stunning solo goal in Brighton's 3-1 victory against Crystal Palace on Saturday. With Glenn Murray going off with a shoulder injury against Palace, Andone could lead the line when Brighton travel to struggling Burnley on Saturday. A hard working and lively forward, expect Andone to get more and more minutes throughout the season and to get both assists and goals for Brighton. He costs just £5.0m in FPL and £7.7m in Sky Sports. Sterling was an unused substitute for Manchester City's midweek win at Watford, so will be fresh and raring to go for Saturday's mouthwatering clash at Chelsea. It should be an entertaining game at Stamford Bridge with a number of the Premier League's top stars in action. If Manchester City are to return home with all three points, expect Sterling to have a large say in proceedings. The 23-year-old's performances continue to improve under Pep Guardiola and he has scored eight goals and provided six assists this season. He costs £11.5m in FPL and £11.5m in Sky and has already got 104 and 108 points respectively this season. The Everton forward comes up against his former side Watford at Goodison Park on Monday. The Toffees have produced some impressive performances this season and had won four successive home league games until drawing 1-1 with Newcastle on Wednesday. The Brazilian has started a number of games as Everton's striker this season but was back on the left wing and scored in their their midweek game with Newcastle. Richarlison has scored seven goals and provided one assist this season. He could be a decent addition for Sky fantasy football managers in particular this week as he would make a strong captaincy choice against Watford. He costs £7.0m in FPL and £8.6m in Sky.